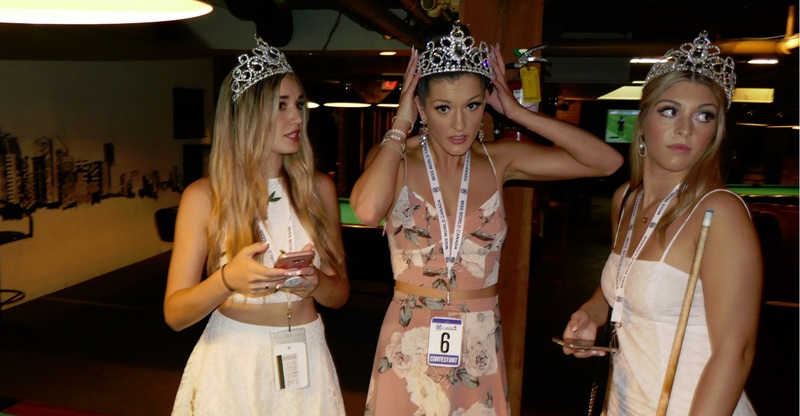 Day Three in the Search for Miss World Canada began with the delegates learning how to dance. The ensemble was shown the first dance steps in the big ballroom at the hotel. Dance instructors who work with the pageant every year are experts at teaching these first simple moves. Four professional dancers put the delegates through small parts of the overall routine. The dance choreographer himself will sew everything together into a fascinatingly complex dance performance by fifty-six participants during intense training sessions on Thursday, and Friday and there will be full dress rehearsals at the Lyric Theatre before the big show on Saturday 28th July, 2018. They crew worked real hard that morning and built-up a real appetite. At eleven am they took a break, retired from their exercise apparel and got changed into some snappy outfits for lunch; the bus departed the hotel thirty minutes later. Here’s the view from the front of the bus when it arrived downtown just after twelve noon. 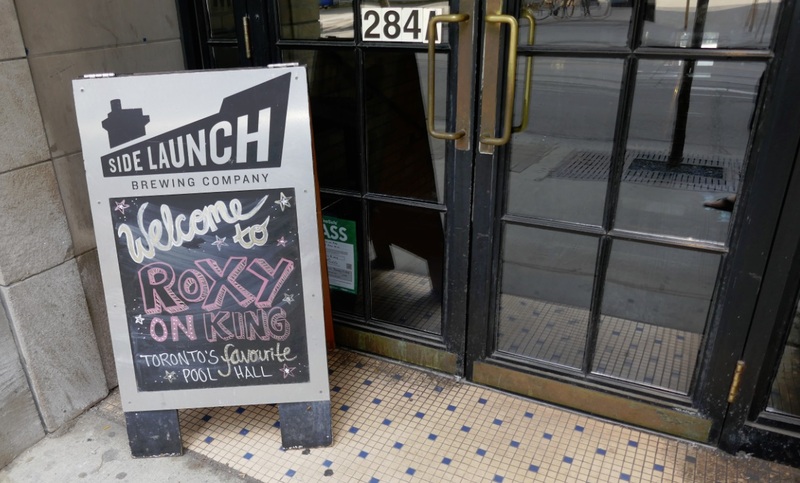 On the ground floor in the center of the theatre building block that stretches between John and Pearl, at 284A King St West is the Roxy Bar billiards restaurant in Toronto which was our gracious lunch host. The big bus appeared all alone on King Street, traveling west on the strangely barren stretch of road in the heart of the city. Yes that’s right, King Street is now clear of cars. The roadway is almost completely deserted of vehicular traffic this summer as this main thoroughfare is the site of a somewhat controversial King St Transit Project. The whole of King St from University to Bathurst has banished private automobiles in favour of public transit, cycling and pedestrian sidewalks. So now people in the area will get more enjoyment walking on the sidewalk. The food at Roxy Bar was unforgettable. 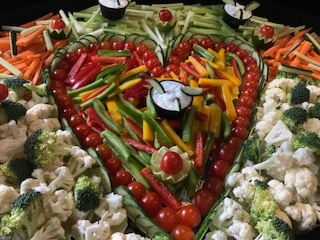 It was an incredible spread of the healthiest things you can imagine fashioned into an overflowing buffet of goodness and flavour. 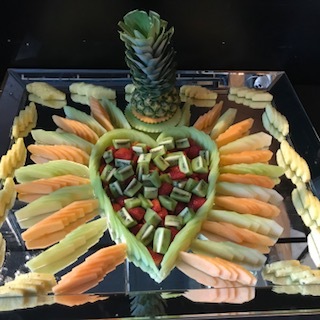 Two heaping fruit and vegetable trays each had heart-shaped patterns. 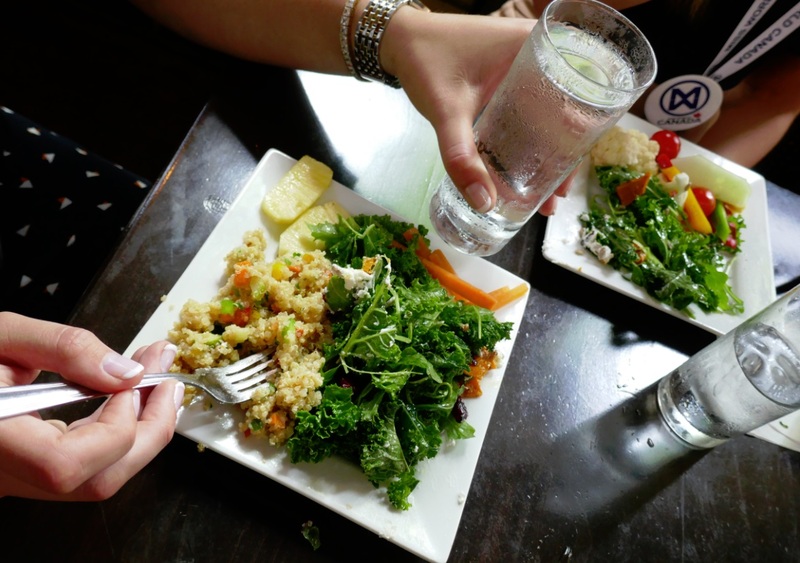 There were three different salads in the buffet; a delicious and healthy quinoa salad, a heaping kale salad, and an Iceberg & Romaine leaf salad. There was also six dozen vegetarian sushi rolls, tempura shrimp and Bocconcini cheese & cherry tomato skewers. For those who don’t know, Bocconcini are small mozzarella cheeses the size of an egg. Like other mozzarella cheeses they are semi-soft, white, rind-less (unripened) mild cheeses which taste amazing when combined with cherry tomatoes on skewers dribbled with Balsamic vinegar and olive oil. 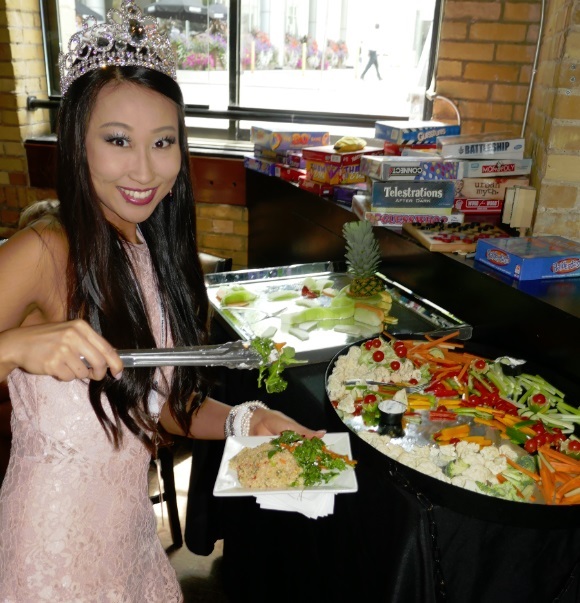 When presented with all this food, just look what they selected for lunch: Above appears to be a small plate filled with kale, carrots and couscous. 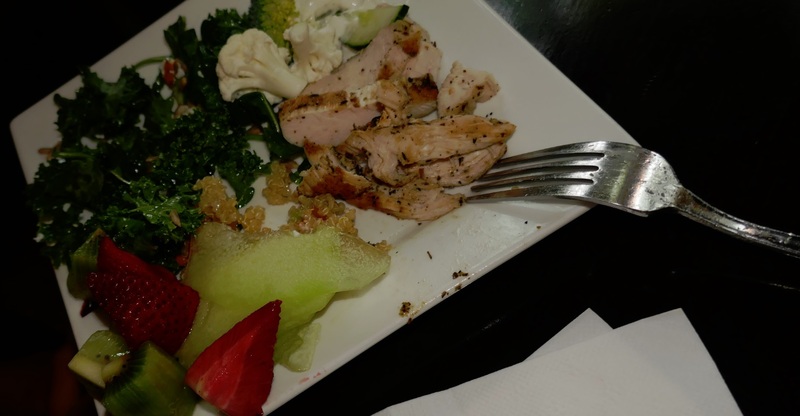 Below we see spicy chicken, kale with kiwi, melon and strawberries. 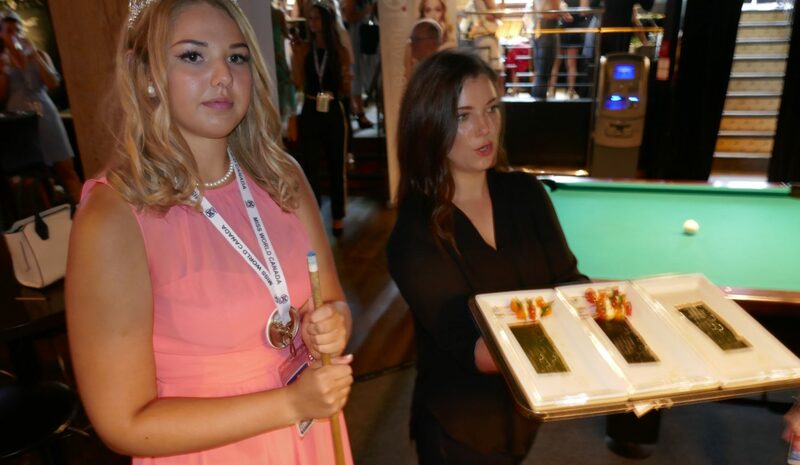 But the feasting didn’t stop there; servers went about with hors d oeuvres on trays to tempt the taste buds of the delegates playing pool at all seven tables. 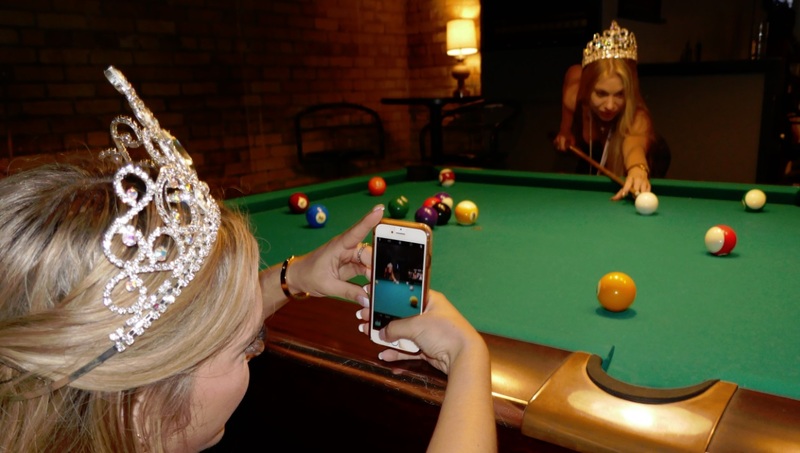 Roxy Bar is a classic pool hall and bar located in the heart of the entertainment district. 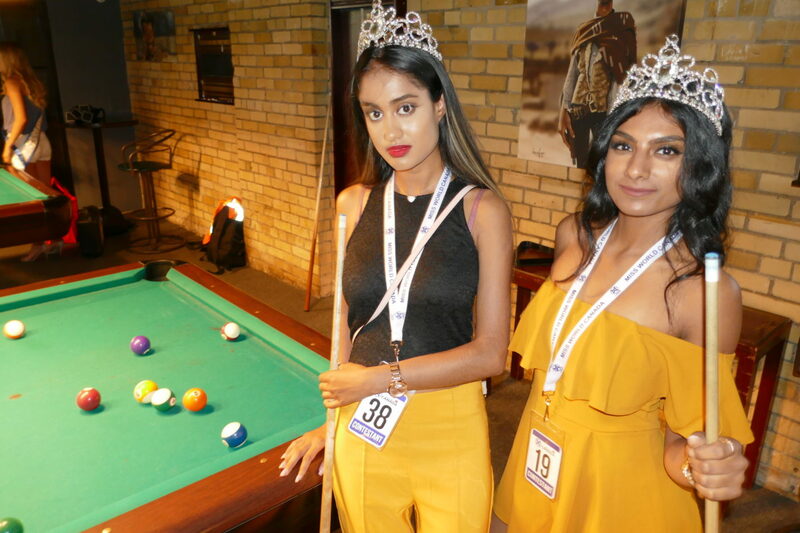 Their billiards tables help keep the game alive in the downtown core. Many years ago this building was Dunn’s, a famous Montreal style delicatessen. 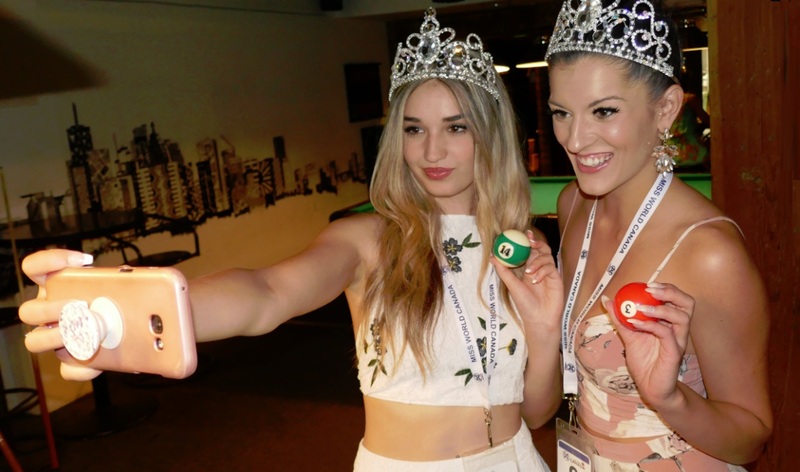 While enjoying a delicious lunch, the delegates were invited to play billiards and post their best ‘pool shots’ on Instagram. The staff made a handsome poster board to spread the word about the contest, and for the next forty minutes the ensemble coalesced into a fantastic creatively smart-phone armed force making eight-ball-shot videos, and break-shot montages and photographing many variations on the classic looker-playing-snooker portrait shot. 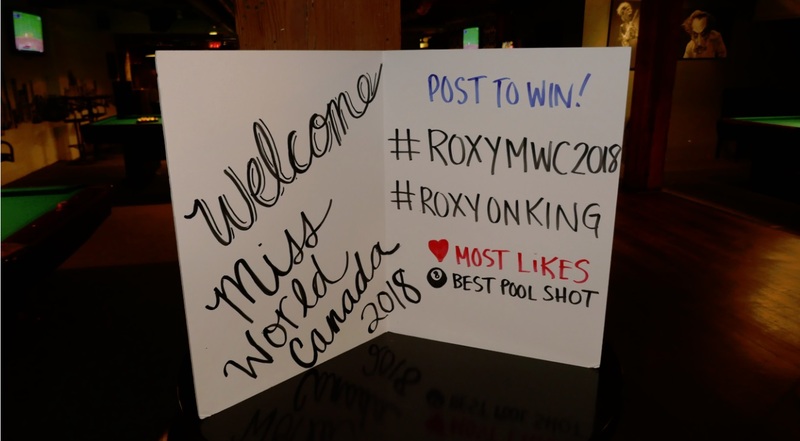 Be sure to follow @RoxybarTO and check all the submissions under #RoxyMWC2018, and #RoxyonKing. The Standard Telecom charging station powered this attraction. This box was the necessary Smart Phone juice dispenser that kept the pictures flowing. There were over forty uploads to Instagram as all delegates proudly embraced the chance to participate in the collective and celebrate this moment in time with @Roxybar andThere were over forty uploads to Instagram as all delegates proudly embraced the chance to participate in the collective and celebrate this moment in time with @Roxybar. Six delegates won Everlast brand exercise equipment that was donated by Premier Matrix Realty. Below we can see Natalie contestant #34 with a Twist Board. The girls were dancing to Drake, In my feelings as they left the room, onto their next adventure.